On our canoe-kayak, discover and experience the life that lurks in the heart of ecosystems. All sea kayak guided packages are designed for a safe practice, teaching good techniques recognized by the FQCK (Fédération québécoise du canot et du kayak de mer) and interpretation of the natural environment. We also pay special attention to awareness of our customers about the importance of wetlands. Our guide/participants ratio is very strict considering the fragility of the ecosystems visited. Our common goal, to leave no trace of our passage! The sea kayak guided packages are offered from mid-June to mid-October. We strongly recommend that you inform us of your visit. To make a reservation, just check the registration section of the site. It is possible to launch your personal boat during the opening hours of the organization. Ideal for outdoor excursions with the family, the Rabaska allows you to safely discover the wonders of the reserve. 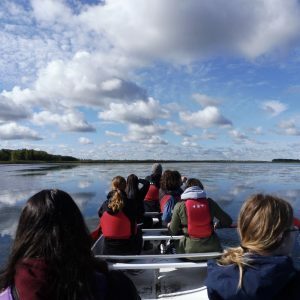 Aboard a Rabaska canoe, you can travel in time, to the era of the fur trade. Perfected by the First Nations, the boat was a very rapid means of transport given the geography of Canada. The word “Rabaska” probably comes from a deformation of the Indian word “Athapaskaw” which is common to the Algonquin and Cree languages. Indian meaning of the word is “grass and reeds here and there”. The phrase reminds us strangely of the lush scenery of the réserve nationale de faune du Lac-Saint-François. Today, the Rabaska canoe is more a means of escape. By its load capacity and stability, the Rabaska canoe is the ideal boat for family outings and school groups. Steering is provided by a guide-interpreter called “helmsman”, which makes it very easy for other passengers. The National reserve is a protected territory of 14 km2 offering more than 10 km of trails. Each trail is in distinct ecosystems, a way to share with you the great biodiversity of the place. Before accessing the trails, we ask you to register at the reception desk. We can inform you of the latest news: unusual observations, breakage, danger or any other relevant information. We will be able to give you sound advice before starting your tour. The outdoor activities is for the whole family. There you will discover what the National reserve has to offer. 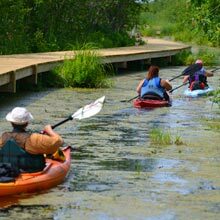 On the Bullfrog’s Trail is a GPS nature rally designed to help visitors discover the wonders of the Lac Saint-François National Wildlife Area (NWA). 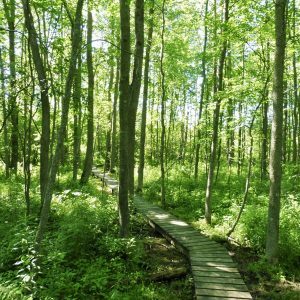 Inspired by geocaching, this activity is intended for school and daycare groups, hobby groups, families and nature lovers who want to get close to nature and learn something while having fun. During the scavenger hunt, you will have to find geocaches and clues hidden along the trails of the NWA. Along the way, you will learn about the creatures that live in this unique protected area. Your starter kit consists of : a GPS device, a sheet of questions, a decryption key, and supplementary learning material*. In short, everything you need for a rewarding, unforgettable experience. Will you be able to find the 10 geocaches and answer all of Bullfrog’s questions? On the Bullfrog’s Trail was produced by Environment and Climate Change Canada. * The supplementary material is for groups only.